The day is here! After countless hours of research and just a tinge of luck my new baby is here! She is a Chanel 2.55 medium in silver hardware, and she is as stunning on photo as in person. The soft buttery leather is pure luxury, and I couldn't be happier. The quilting creates these little pillows, and for the lack of a better word, adorable. While the lambskin is buttery soft and luxurious it does not come without a price. I knew it was going to be high maintenance before I purchased it, but after just one use I have already noticed slight creasing in the leather from opening the flap.The zipper inside also creates these little indentations on the inside flap so storing the bag with padding is crucial. Mr. K: So this is the purse? Mr. K: I guess so. What's so great about it? Me: It is a CHANEL!! *paused* Okay, imagine you just unboxed a Canon 5D with L series lens. Mr. K: *chuckles* I see. Let's go to dinner. Get ready. Mr. K: What doesn't fit? What do you mean? Mr. K: 5D with L series lens clearly wins. I can't believe this bag is so "useless". Mr. K: Well, if you can't even use a purse doesn't that make it use-less?? This particular beauty currently retails for over $4400, which is just absolutely...expensive. If you are looking for a Chanel I would highly suggest going to a Chanel boutique and trying some on in person to get a good idea how much room you have. Also, consider buying vintage or pre-loved, but make sure you do your research before committing to a bag. There are a lot of fakes out there and I would hate for any of you to be scammed. 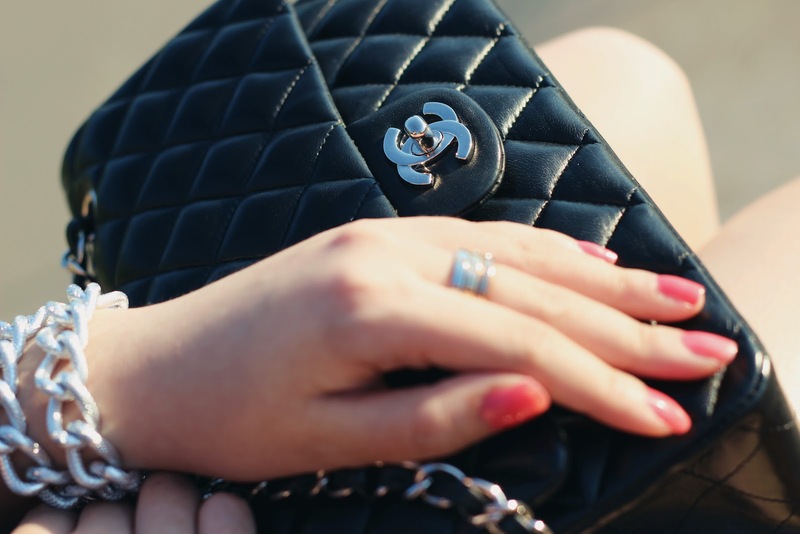 Here are some valuable resources for when you are buying your Chanel in the second hand market. Immerse yourself with photos of authentic bags, and be familiar with how fakes can present themselves so you can spot one when you see one. Good luck and happy shopping! Wendy from Wendyslookbook, who is always an inspiration for me, has a video on buying purses online. Wendy and MM always have magnificent art like photographs on the blog. Here is one featuring her mini. A blogger that I have followed for a very long time Jean from extrapetite.com did a review on the 2.55 flaps if you want to know more about the bag click the link above. She also has a post on the Petite shopping tote and wallet on a chain if you want to see them in action. Last but not least Sydney from petite little girl shared her Chanel buying experience. I found it very helpful and inspiring.